First prototype of the Skypirate on the runway. 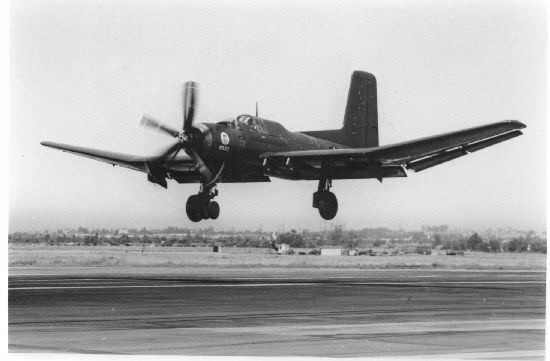 The Douglas XTB2D-1 “Skypirate” was a large, single-engine torpedo bomber built for use on the Midway class carriers during World War 2. At the time, it was the largest aircraft to be used aboard a carrier, dwarfing even two-engine designs. Unfortunately for the Skypirate, engine troubles, little support from the US Navy (USN), and numerous setbacks with the construction of Midway-class carriers nearly doomed it from the start. 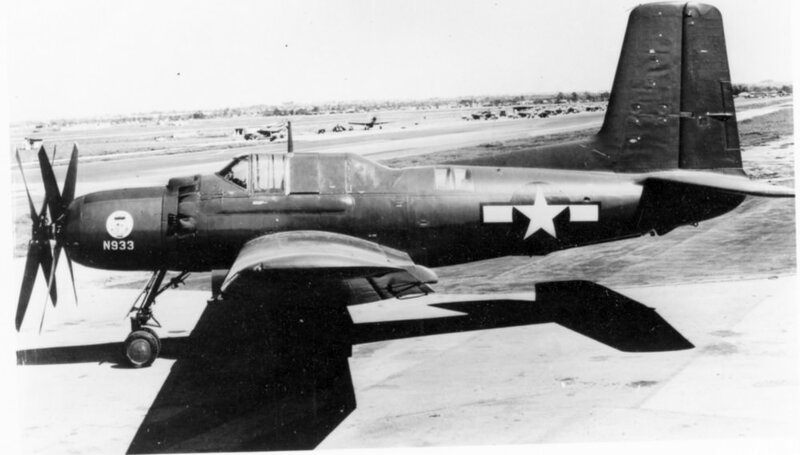 By the time it was airworthy, it was trying to fill an obsolete role which other aircraft, such as the TBF/TBM Avenger, already filled adequately. Work continued after the war, with several attempts to revive the program but it proved to be too costly and the Skypirate program was finally cancelled in 1947, with the two prototypes being scrapped in 1948. With engagements such as the Battle of the Coral Sea and the hunt for the Bismarck, the effectiveness of torpedo bombers, such as the TBF/TBM Avenger and Fairey Swordfish, was clear. With the announcement of the large Midway-class carriers, the possibility of a new torpedo-bomber/scout bomber came about. In February 1942, a competition was put forward by the Navy for this role. The Douglas Aircraft Company, based in Southern California, proposed the Skypirate. The single-engine Skypirate was picked from eight different designs, most of which were two-engined. The Bureau of Aeronautics (BuAer) wasn’t expecting a single engine design to be submitted, assuming the specified massive carrying capacity would require a two-engine design. The program was being headed by Ed Heinemann as lead designer and Bob Donovan as the chief engineer, who would be on the project until the end. An impressive look at the massive Skypirate from the front. In November of 1942, Douglas was given permission to begin production of two prototypes and a mockup of the XTB2D-1 (then called the Devastator II, before being changed to Skypirate). Delays in the development of the Midway class would continue to hamper the Skypirate throughout its life. 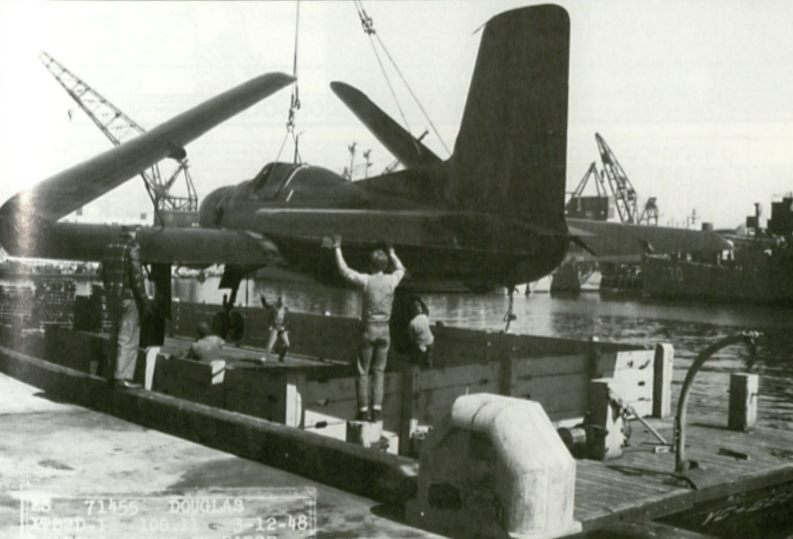 The finished product was a formidable aircraft, capable of carrying four torpedoes from land or two torpedoes from a carrier, the former being four times the carrying capacity of the TBM Avenger. 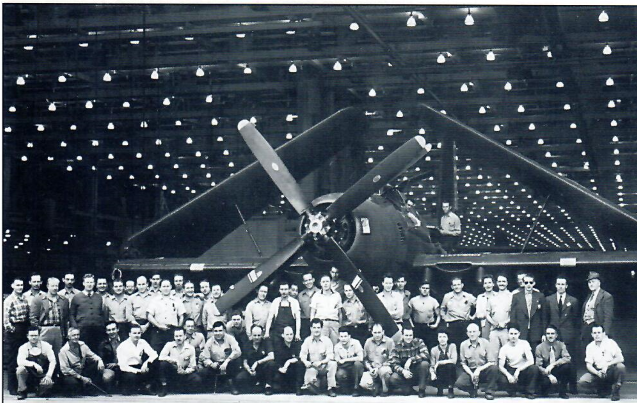 In March and May of 1943, the mockup was inspected and an order for 23 production aircraft was put in. This was enough for a single squadron to operate from a Midway carrier. Problems began about this time, with the delivery of engines and propellers being delayed. By 1944, the Skypirate was still not airborne and it was obvious it wouldn’t be operational anytime soon. With earlier torpedo bombers performing adequately, a lack of support from the Navy, most of the Japanese fleet in shambles and continued delays with the Midway class (which would eventually sail after the war), the 23 production planes were cancelled. On February 18th, 1945, the first Skypirate was rolled out of the production facility, being completed on March 13th and finally going airborne on May 8th. Neither of the prototypes had any defensive armaments, but they were tested with torpedoes and drop tanks. Although no production was to ever start, the Skypirates would continue flying until the end of the war. During one such flight in June of 1945, a Skypirate was damaged mid-flight, but the craft was brought down safely. Engine problems were a frequent issue with the Skypirate and propeller problems would ground it in August of 1945, not flying again until after the war. Perhaps the most well known photo of the aircraft, the Skypirate prepares to land. Postwar, the aircraft industry changed with the introduction of jet aircraft, thus eliminating the need for many prototypes being developed during the war. The Skypirate was no exception. With the torpedo bomber role now fading, the Douglas firm looked at other options to revive their Skypirate. Some ideas included using the Skypirate for an electronic warfare role or even as an anti-submarine aircraft (a role overtaken by another piston engine aircraft, the Grumman AF Guardian), but none of these propositions ever managed to become reality. As the Cold War was just beginning, the Skypirate program ended in 1947 and the 2 prototypes were scrapped in 1948. The Skypirate is most likely the largest single-engine aircraft to ever be designed for carrier operations. In comparison, the twin-engined B-25 Mitchell medium bomber measured around the same in length and width. The 2nd prototype in flight, notice how the tail is shorter in comparison to the first prototype. The initial Skypirate design had an internal bomb bay, which the prototypes dropped in favor of four external Mark 51 Mod 7 bomb hardpoints. These hardpoints could carry a range of weapons including 500Ib-2000Ib bombs, torpedoes, depth charges, mines or even incendiary bombs. The use of up to 4 Mk.13 Torpedoes (from land) were planned had it entered production. The Skypirate could alternatively carry up to 8,400Ibs of bombs. For offensive armament, the Skypirate had 4 M2 Browning machine guns in the wings. For defense, it had a Firestone model 250CH-3 remote turret behind the cockpit which carried 2 M2 Brownings and a turret in the back of the lower fuselage which carried a single M2 Browning. The lower turret was remotely fired through electronic control and powered hydraulically. Drawings indicate that Mark 2 Gun Containers could be added for extra forward firepower but none were ever attached during testing. 300 gallon drop tanks were also fitted during testing and could have been used had the craft been operational. The sole mockup made alongside the 2 prototypes. Along with such an impressive weapons payload, the Skypirate was full of advancements which would have improved its performance. To get such a large aircraft off the ground, the Skypirate was powered by a single Pratt & Whitney XR-4360-8, the largest radial engine ever built up to that time. The engine had a unique exhaust style that combined the exhausts in alternating rows to lower the effects of backpressure. Being a carrier-based aircraft, the Skypirate had folding wings as well as a catapult hook. 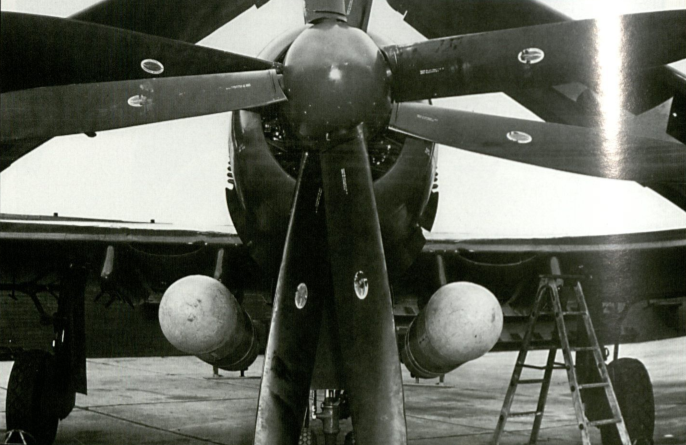 The inclusion of a tricycle landing gear was also interesting, as it helped with bomb loading and carrier space. Most single engine aircraft of the time preferred using a tailwheel. The Skypirate had large flaps that extended the length of wingspan. The outer flaps served as ailerons while the midsection flaps were used as dive flaps. The dive flaps could also be lowered to help the aircraft cruise or assist in turning to help ease the stress off the aircraft when fully loaded. To assist with bombing or flight in general, a Type 3 Sperry vacuum-controlled, hydraulic autopilot was also to be added. A de-icing system was also added that pumped hot air over the wings and tail section. The planned modifications of the prototypes are interesting to note. 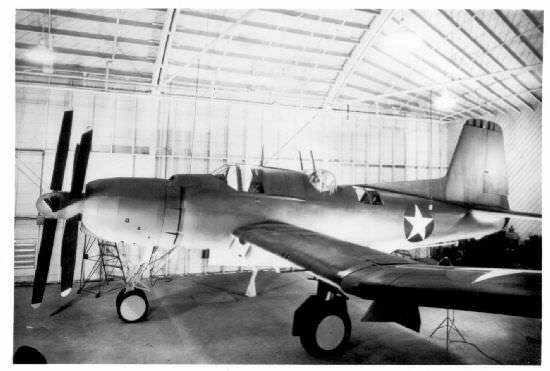 The 2nd prototype (Bu.36934) differed from the first, having a shorter tail of 8.6 ft, compared to the regular 10.5 ft tail of the original design. This was done most likely to conserve valuable space when inside a carrier. Along with these differences, plans to fit a jet engine in the fuselage of the 2nd prototype were made, but nothing ever came to fruition. 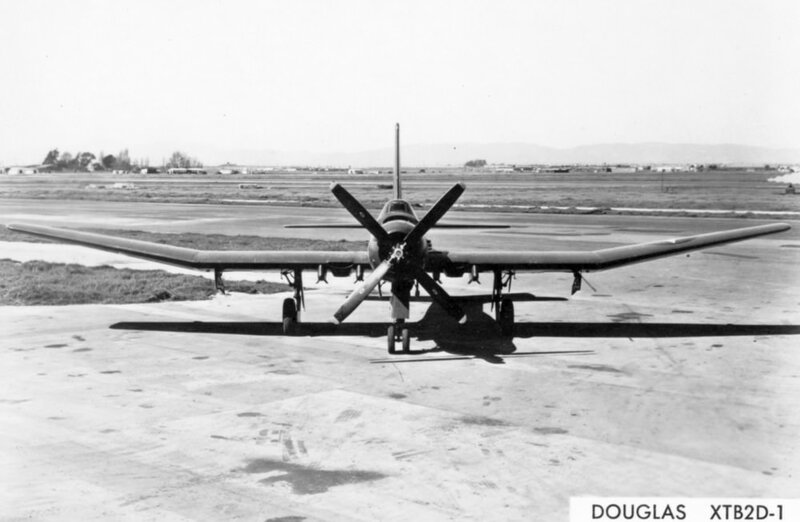 The first prototype (Bu.36933) had a larger tail and was planned to be converted for the scout bomber role. These plans included adding cameras onboard. As with the jet engine designs, these also never came to be. XTB2D-1 Bu.36934 – The 2nd prototype. The tail was shortened to 8.6 ft. Also lacked any armament. TB2D-1 – Proposed production version, 23 were ordered and planned production was to be 100 built every month. These versions were to be fitted with four .50 caliber machine guns in the wings, two in a Firestone power turret and one remotely controlled in the ventral hull. Eventually, the production versions were cancelled in favor of higher priority projects. 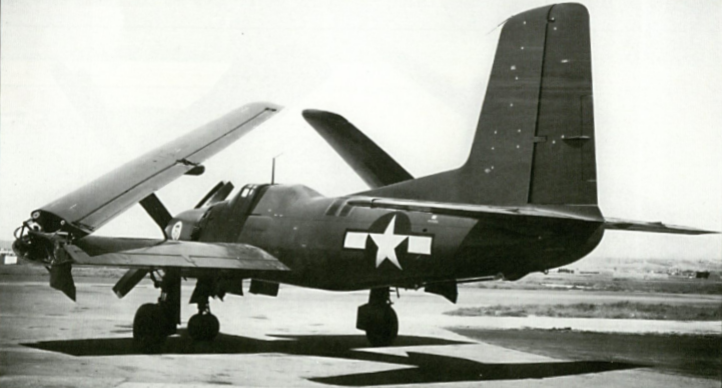 United States of America – Slated to be used aboard the Navy’s Midway-class carriers, with the end of the war and other setbacks, the XTB2D-1 was never used operationally. The design team poses with the first Skypirate on rollout day. The last known photos of the Skypirates before being scrapped. One of the prototypes with mounted Mk-13 torpedoes. Kowalski, B. (1996). 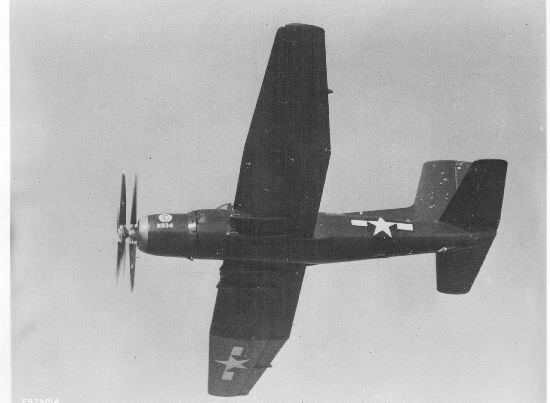 Douglas XTB2D-1 Skypirate. Simi Valley, Calif: S. Ginter.